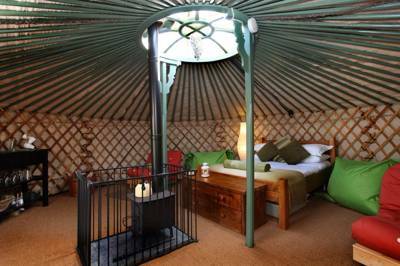 Sustainably sourced from Mongolia, with a modern British twist, our yurts are wooden framed with a felt lining, covered with a waterproof canvas suitable for a British Climate. Our Cornwall yurts are set on strong wooden decking (so no squelchy mud underfoot!) and inside you’ll find large handmade beds, log burning stoves and snuggly blankets and furnishings. Our yurts have Electric, WIFI and refrigeration. We also provide all of the practical things you need to make sure your self-catering stay is hassle-free such as pots and pans, crockery, cutlery and even herbs from our communal garden!